The Distribution Server schedule tracing is enabled by setting Schedule Trace to SCHEDULE (or to SCHEDULE & REPORT if you also want to enable report tracing) in the General tab of the Console Configuration tab. ReportCaster also provides the ability to enable SCHEDULE or SCHEDULE & REPORT tracing on a per schedule basis when dynamically running the schedule on demand. When you run a schedule, the Schedule Trace setting specified in the ReportCaster Configuration tool appears along with options that enable you to change the setting for this particular schedule. Jobid.trc (for example, J0ud2a6kqk01.trc). Contains all information related to the execution of a job. This includes information about the scheduled procedure, distribution information, and the log creation and its contents. When SCHEDULE & REPORT traces is selected, this file also contains the report sent back from the Reporting Server. procedure.log Contains distribution information, report parameters (if any), pre-processing and post-processing steps (if any), procedure code (if Managed Reporting), or an -INCLUDE FOCEXEC (if Server Procedure). Jobid.err. If there is a processing error, ReportCaster generates a jobid.err file containing information about why the report was not distributed successfully. Information Builders recommends searching for *.err files when viewing trace files. DistRun.trace Contains IBFS trace information. DistRun.html Contains an .html version of the report. session.log Contains information about the IBFS session. Note: You can identify the Job Process ID of the target job by running a log report. For more information about log reports, see Tracking Schedules or Job Logs. A Job Process ID begins with a J and is followed by a series of random digits and lowercase letters. 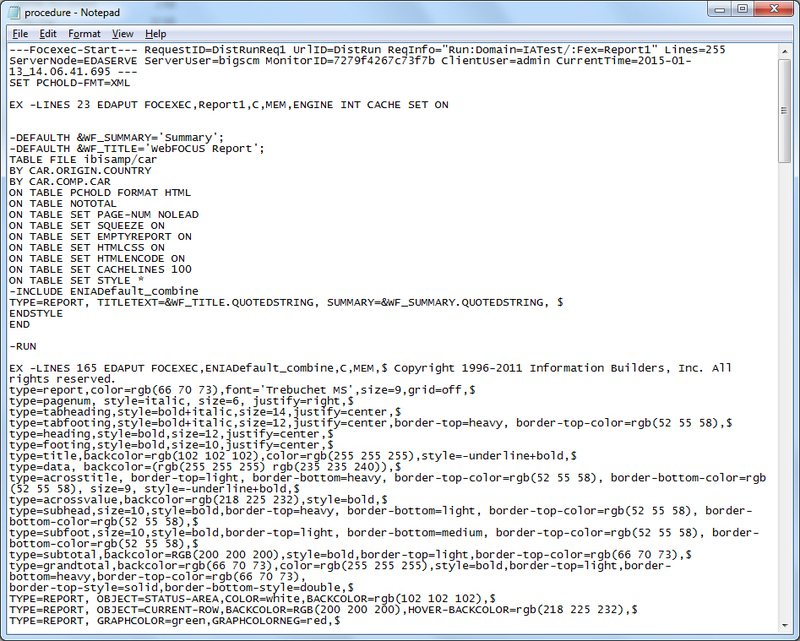 The following excerpt of a schedule trace file is for job ID reportcaster.log_2011-12-20.log. The reportcaster.log_2011-12-20.log file shows the date and time that the worker thread began, the parameters associated with the scheduled job, and the connection information for the Repository. console.err when the console terminates. disp.err when the dispatcher terminates. main.err when the main thread terminates. reader.err when the reader terminates. Jobid.err when there is a job processing error. When the Schedule Trace setting is turned OFF, the files and folders in the Distribution Server /temp directory, and the Schedule trace files J*. * in the /trc directory, are deleted when you start the Distribution Server. Therefore, if you want to keep any of these files, you must either back them up or make sure that schedule tracing is enabled (meaning that Schedule Trace is set to either SCHEDULE or SCHEDULE & REPORT in the ReportCaster Server Configuration tool). ReportCaster supports Resource Analyzer. When ReportCaster runs Server Procedures or a WebFOCUS Report (Managed Reporting), it sends commands to the Reporting Server. Resource Analyzer then retrieves these commands for the purpose of monitoring the resources used to create the output to be distributed by ReportCaster. If you are not using Resource Analyzer, the commands are ignored by the Reporting Server. You can view these commands in the Schedule Trace file for the specific job (provided that Schedule tracing is enabled in ReportCaster). For more information about the commands catalogued by Resource Analyzer, see the Resource Analyzer Administrator's and User's Manual .